How much of the green and open space do you get to enjoy? For somebody living in Trivandrum, the space is just a little larger than your daily broadsheet newspaper. Bengalureans get 2 sq metres of greenery, way below the WHO recommended 9 sq metre per resident. A Varanasi resident is more fortunate, with a green space as large as 6m x 4m balcony. The urban green cover is not something that India can be proud of. Various studies conducted in other cities too show the same plight, noted in this earlier report. While these statistics roughly show the vegetation cover in the cities based on remote sensing, there is no data to show the number of trees that each city has. Take the case of Bengaluru. No one is quite sure about the total number of trees. Some say it’s 10 lakh and the civic body officials say it’s 50 lakh. But there is no accurate data to prove any of these claims. In every city, the municipal administration, the railways or Metro Rail corporations, city development authorities, corporate houses and NGOs spend a lot of money for “greening” the city. But there is absolutely no information about where the saplings were planted, what species were planted, how many of them survived and what saplings needs to be planted. Two years ago, the Ministry of Environment and Forest had announced India’s first nationwide tree census. But there is no information available on the ministry’s website about whether the census was taken up and what the status is. In July 2014, the Ministry of Environment and Forest came up with a draft guideline for conservation, development and management of urban greens. The guideline speaks about the protection of existing greens/ trees by carrying out tree census periodically. It suggests surveying the trees once in every five years with the participation of concerned departments, civil society/ citizens, schools, NGOs and suitable institutions. “It will be appropriate to make use of GIS for mapping of urban greens and trees, which along with census data should be placed on websites for general information,” the draft says. In Bengaluru, the civic body – Bruhat Bengaluru Mahanagara Palike (BBMP) talked of conducting a tree survey two years ago, but it failed to take off. While government and civic bodies seem to have done little to identify and map the trees, small initiatives by communities and citizen groups are taking off. 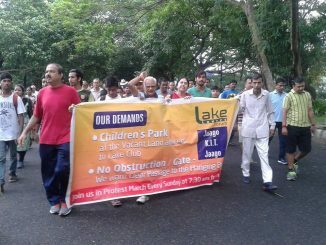 Around six months ago, in Bengaluru, citizen groups put up a strong fight against the government for proposing to construct a steel flyover. According to the government, around 800 trees were to be felled for the project. 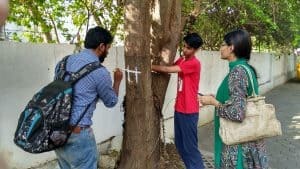 Meanwhile, a bunch of youngsters led by Varun Hemachandran who was part of Citizens for Bengaluru, the civic group that campaigned against the flyover, took up a tree survey along the stretch where the steel bridge was proposed. The tree mapping by Varun and team emerged with startling figures. They marked over 2,000 trees that were going to be destroyed if the project was implemented. The data was in contrast to what the government had projected. Thus began the tree mapping project by Talking Earth, a non-profit organisation founded by Varun Hemachandran. Varun explains how the tree mapping began as an exercise for people to closely observe the trees around their neighbourhood. “As we all continued to count and map the trees as a part of Steel Flyover Beda campaign, we realised that around 2,000 trees were going to be cut for the project. Later on, we decided to do tree mapping across Bengaluru and we pitched it in Chennai and Delhi too,” he says. Talking Earth maps trees using a mobile application, with the help of student volunteers. The volunteers are initially trained in a workshop on how to use the app and map each tree in five minutes. Since the team is working on building a completely new visualisation engine, the map is not online for public yet. Emphasising the need for tree mapping in cities, Varun says while mapping the trees, his team came up with an observation. Several saplings had died of disease, with animals eating them up or because they were not rooted properly. “Every time when a new project comes up and trees are chopped, the government promises to plant saplings to compensate. But nobody knows where these saplings are planted or whether they even survive. Tree mapping helps to keep track of all the saplings and trees,” he explains. According to Bengaluru-based naturalist Ganesh Ram who too is part of the tree mapping project with Talking Earth, tree mapping will help people to know the number of trees in each neighbourhood, their biological value and the kind of ecological services they provide. “We believe, tree mapping will help us understand the value of trees with proper details of trees in hand,” he says, referring to quantifying the value of a tree in terms of the oxygen it provides, the temperature it reduces, and pollutants it helps combat. This is not for the first time that a tree mapping exercise has been taken up in Bengaluru. There have been quite a few initiatives, but most of the projects did not sustain or expand beyond few months. In 2015, a citizens group took up tree mapping on one of the roads in Indira Nagar. They had then identified 447 trees and invited public to adopt them. Over 70 trees were adopted by citizens and their job was to ensure that the trees are well maintained. The best part of this initiative was that all the trees were mapped with the simple Google map and all the information generated about the trees were open for public. 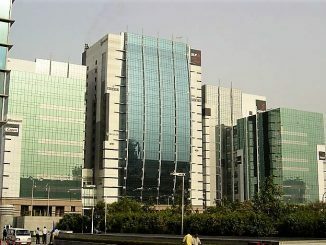 Though the team had plans to expand it to other cities, the plan did not take off. The mapping site was last updated in August 2015. Gubbi Labs, a social enterprise embarked upon a tree census in Bengaluru in the beginning of this year. According to Dennis C Joy, Resident Editor at Research Matters published by Gubbi Labs, volunteers have so far mapped nearly 5,000 trees. Backed with the data, they are trying to analyse land cover change in specific areas. “We hope to implement an annual tree census in the years to come to monitor the change in green cover in the city,” Dennis says. Bengaluru is not the only city where citizens have take up the task of tree mapping. Civic groups and individuals are doing isolated efforts of tree mapping in several other cities too. 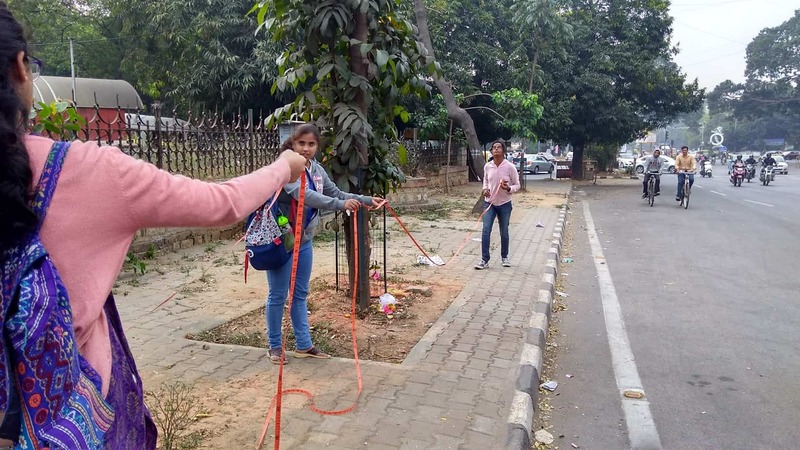 Delhi has an initiative by two organisations – Vertiver and Iora Ecological Solutions – taking up a tree mapping project in Delhi, this month. The tree mapping which is underway shows that 50 species of trees are found in central and southern parts of the city. Botanist and author of “Trees of Pune” Shrikant Ingalhalikar started documenting trees in Pune under the project title Flowers of Sahyadri in 2014. During the course, he learnt that as many as 30 trees that were the only known specimens of the kind perished in over a period of five decades in Pune. He has marked the trees in three categories – rare tree, heritage tree and avenue tree. 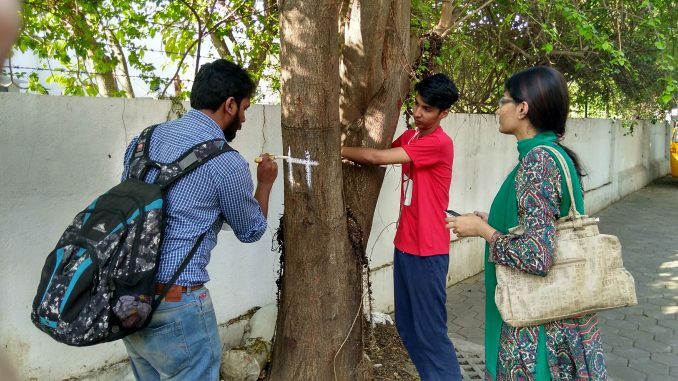 In Mumbai, it is students of Indian Institute of Technology, who have take up tree mapping initiative. Last month the students of IIT started to map and document trees inside the 550-acre Powai campus. They recorded a total of 220 trees of 40 species in the first few days. The survey is expected to be completed this month. In yet another tree mapping initiative, India Biodiversity Portal (IBP), a repository of information on India’s biodiversity is organising the fourth edition of their neighbourhood tree campaign. It allows people across the country to count the number of trees in their area and keep track of their growth. R Prabhakar, a member of IBP, says the objective is to document the species of trees in various cities and villages across the country. By registering at the portal, anybody can become a member and volunteer for tree mapping. The data has to be uploaded online and all the data will be made available to the public for observation and analysis. Though several citizens and organisations are putting in their best efforts, can all these initiatives help in large scale mapping of trees? Harini Nagendra, Professor of Sustainability at Azim Premji University and author of Nature in the City: Bengaluru in the Past, Present and Future, while appreciating the effort put by citizens towards protecting the trees, says that the tree mapping initiative should be taken up by the respective government authorities. Harini says species inventories are must for a city. “Tree mapping is important because we need to know where the trees are planted and cut or dead. We never track the trees. We don’t know for how long specific tree species live. There are anecdotes about certain tree species that live longer than others or fall quickly. 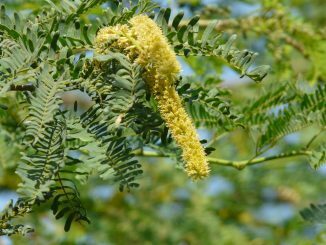 We need to have a good understanding of all this; know the health condition of the trees, monitor the species,” she says. In various cities across the globe including New York, Boston, London etc, tree mapping is done by the government with communities and citizen groups partnering them. “Communities or voluntary groups alone cannot do large scale mapping without government support. Tree mapping at the city scale is the responsibility of the government because it is the government which decides on planning and action part. I agree that the citizen groups are doing a great job; they are filling the gaps since the government is not doing its work. It is important that they do it. But they should also ensure that there is no overlapping of survey information and also that tree species is rightly identified,” she suggests. She also stresses on the need for organisations to be transparent with the data. “The data should be open so that public can use it and even able to edit in case of wrong information/data,” Harini concludes. Correction: An earlier version of this article mentioned that Gubbilabs does not plan to open up the information for the public. They have also clarified that all their data is already present in the public domain and is open access. All tools and methods followed in the exercise is in the public domain as well.